MAC is making its highly-anticipated return! 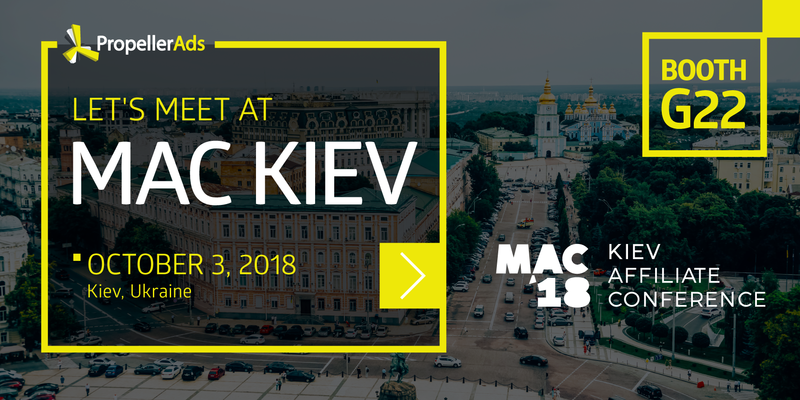 On October 3, affiliate community is gathering in Kiev to gain insights from industry heavyweights and broaden the ties between marketers, agencies and networks. Attendees will have an opportunity to network with some of the key stakeholders and leaders in the industry: it is expected that more than 200 companies from 40 countries will participate in the conference. – Native Push Notifications – an ad format that has a million and one benefits: direct reach, super fast delivery, giant audience, diverse targeting options and proven effectiveness. – Native Interstitials – nothing says “impressive ad” quite like a Native Interstitial. Use it when you need more creative space and direct contact with your audience. It comes in a kit with a high CTR! – Native Ads (widgets) – an ultimate choice if you want your ads to appear right where users are searching for content. Enjoy higher engagement and outstanding performance. Ask us about our new products or just come by to say hello! We would be happy to meet you to talk marketing. Let’s make it even easier – book a meeting with one of our team members by clicking the button below. See you in Kiev!